For those unfamiliar with Ohio bikeways, finding facilities along the trail may be problematic, depending on which trail you ride. So we put together this little primer to let you know what to expect. 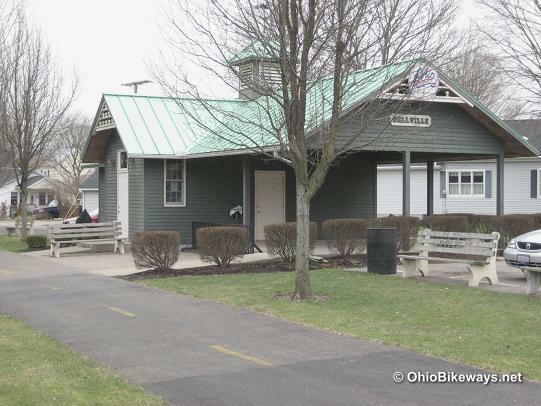 Public water and restrooms at parks and trailheads are generally open in-season (during the warm weather months), which typically range from late April into October in Ohio. The Ohio & Erie Towpath in the Cuyahoga Valley National Park is one exception where some public facilities are open year-round. Beware, however, that budget constraints can affect the availability of such facilities at times. Click on the trail class category listed by each trail on the Trail List pages to give you a quick overview regarding facilities and water for each trail. For more specifics, use the Ohio Trails map. Click on a trail marker to see if a subset of facility markers is available (if so, they will be displayed upon clicking). Clicking further on the facility markers will reveal more details regarding that location. For a more complete understanding regarding Ohio multi-use trail facilities, read on. We're using facilities as a general term that refers to restrooms, water sources and parking, the trailside stuff that's most important to trail users. Think of them as the necessities during your ride, like when you're about to run out of water on a hot day. Amenities are nice extras such as food concessions, bike shops and ice cream stands. These are trailside perks or bonuses that provide useful goods or services that can make a long day in the saddle even more enjoyable. Ohio boasts a wide variety of bikeways. Some have numerous facilities, parking and amenities, while others have, well... mostly just trail. Sometimes economic factors don't allow for trailside development and in other cases -- such as in protected natural environments -- eco-intrusion is frowned upon and kept to a minimum. So if you're riding through a nature preserve, expect facilities to be sparse. Parking may be limited and water may not be available here. The Blackhand Gorge Trail is a typical example. It does have parking at each endpoint, but drinking water is not available and there's only one latrine at one end of the trail. Many bikeways use a system of parks along their routes to provide users with what they need during their journey. The Emerald Necklace Trail is such an example of a park system (called reservations) linked by trail and parkway roads. Though some water and restroom facilities are trailside along the Emerald Necklace, others are off the main trail and require a short ride into the parks to locate them. 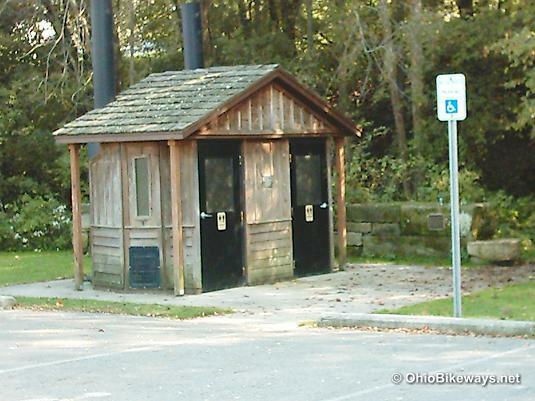 However, facilities and their locations are not consistent along all Ohio trails. Some parks may have drinking water and restrooms with plumbing, while others have latrines or simple portable toilets. Other parks or trailheads may have nothing more than a patch of grass and some parking spaces. Some secluded rural rail-trails may require riding into towns along the route to find facilities, whether they be in local parks or business establishments. Be sure to plan ahead on any trail that has no water source, limited facilites, or distances too great between those facilities. Occasionally you'll have to improvise on bikeways that do not offer restrooms and water by using nearby businesses, such as gas station or mini-mart facilities. This is seldom a problem for cyclists as most establishments near bikeways are accustomed to trail users as customers. More popular trails, or those in well-developed areas, often have trailside facilites and amenities that cater to users. No time is lost searching for water sources or restrooms. One can roll up to trailside break stations, use the facilities, fill water bottles and carry on. In some cases vending machines or bike repair stations are also available. When cafes, eateries and ice cream stands line the route, the commuter or touring cyclist is well-provided for and can enjoy more time on the trail, rather than searching for sustenance. The 18-mile Richland B & O Trail is a good example. It's route features two break stations along the trail, as well as park facilities at each endpoint. Nearby eateries and ice cream shops, numerous parking locations and a trailside bike shop round out the amenities here. So, have a good understanding of what facilities are available along the trail(s) you plan to ride, and the distances between them as well. This is valuable information, not just for touring riders, but also families with children in tow. But relying too heavily on that information can backfire as well. I remember a ride along the Little Miami Scenic Trail where I was timing mother nature's call with the next stop along the trail, where I knew restroom facilites were available. Upon reaching the facility as planned, I was congratulating myself on my perfect timing, when much to my surprise, the restrooms were closed -- oops!